I have a fresh release to share with you guys for the new synth Rapid, an insanely good soundig, virus killer, synth. After spending a few months with Rapid, it has quickly become my favorite vsti, and I've tried nearly all of them in existence. I know its a relatively new synth, so if you guys haven't heard of it, I highly suggest you check it out. It is a very high quality synth that uses very low cpu and is extremely intuitive to use. I've also tried out Avenger from Vengeance and it is no question which one is easier to use and has a fuller more pleasant sound (and easier to achieve). Though both are still excellent. 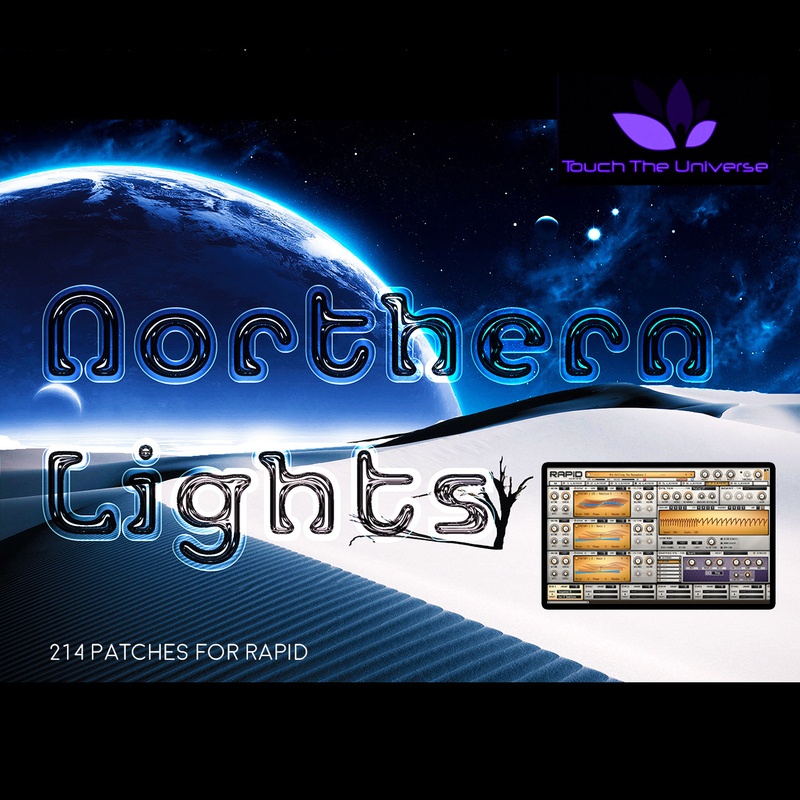 Touch The Universe releases the Northern Lights Soundset for Parawave's Rapid after a short hiatus from its initial release.The soundset contains 214 presets and is suitable for nearly any contemporary electronic music genre. I'll be showcasing the patches in goa trance, progressive trance, psybient, and atmospheric chillout songs and videos. The highlights of the soundset includes the leads, which were programmed with a creative use of vibrato and modulation assignment so they can almost appear to be singing to you. They can be silky smooth or very edgy with a very clear distortion. A lot of them have filters cleverly assigned to macros and modulation wheel to create a formant like effect, which gives a really unique and modern feel to the leads. Some of the patches also utilize the formant wavetables, combining the creative filter formant effect with bonefied formant tables, creatively blending the best of both worlds -- lots of formant action! Rapid really excels in this category. In addition, the soundset comes with some very beautiful and complex pads with rythmic and lush textures, all multi-layered and with modulations built into the patch and assigned to modulation sources and macros. Playing some chords with them will create a very chilled out and unique atmosphere, opposed to traditional sustained pads. Also, the plucks are very unique and a lot have a plucky vocal quality to them. All heavily assigned and designed to play beautifully with a keyboard with creative and finely tuned velocity settings, spread throughout the layers. Likewise, the basses are also designed for playability and range from deep analogy through snappy digital basses. There are some really nice exotic, oriental type formant bass patch showcases I look forward to sharing. One of the great things about Rapid is that samples can be loaded, and it comes with a lot of wavetable substitues for traditional instruments. I had a great time making some very realstic cello and vocal patches from the wavetables, and blended them in with there sampled counterparts to create an interesting blend of realistic instruments with purely synthesized psuedo counterparts. Volume levels are adjusted slightly to match across presets and at a level near the factory bank. More modulation and macro assignments were added, as well as detailed preset descriptions and usage tips. A cross between a synthesized cello sound and a choir type sound, using heavy reverb and an ensemble. There are a total of 3 layers used, each with there own gate. I cycle through the macros and tweak the dry/wet on the gate of the layers. It is a live improvisation in one sitting. Lead Showcase (Part One) -- A few Exotic Layered Leads.